‘Love the Lord your God with all your heart and with all your soul and with all your mind’. This is the first and greatest commandment. And the second is like it: ‘Love your neighbour as yourself.’ All the Law and the Prophets hang on these two commandments. Jesus was drawing on direct words from the law. The first part came from the Shema as recorded in Deuteronomy 6 which begins, ‘Hear,O Israel: The Lord our God, the Lord is one’ (Shema being Hebrew for ‘hear’). Flowing from these words came the command to ‘love the Lord your God…’ These are words that faithful Jewish followers of God would have repeated out loud everyday. The second part about ‘love your neighbour as yourself’ can be read in Leviticus 19:18. Jesus cuts through all the debating and all the trying to ensnare him in some way. He gets to the point – love God with all you are and love your neighbour as yourself. Everything else hangs on those two things! How easy to read such words about love and it just washes over us and makes no impact. 1 John 3:1 – ‘How great is the love the Father has lavished upon us that we should be called children of God’. A love ultimately expressed in Christ dying on the cross to deal with all the wrongdoing that gets between us and God and each other. How do we respond when we think about the love of God? May be we are grateful and seek to live and act in the light of His love? Perhaps we think how can we possibly love in return? May be we question that God is loving due to personal circumstances or things we see in the news? Perhaps we doubt that if there is a God who revealed himself through Jesus Christ, that His love can actually mean anything meaningful to us individually? Are these words that Jesus said about loving God and loving others relevant, possible and life impacting? Or is it just nice sentiment or misguided words which has no real application to things in 2018 like racism, prejudice, injustice, broken relationships, personal tragedy, community life, faith practice? 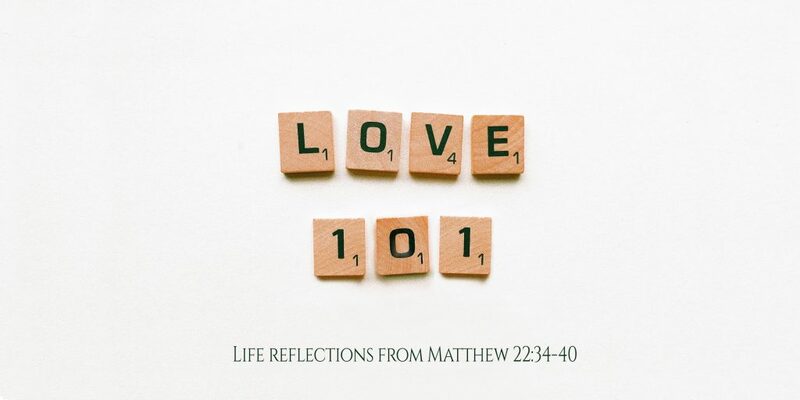 Love:101 – are we all willing to engage with this and see how our lives can be shaped afresh by God’s love?